The Kailasanathaswamin Temple, located in Kanchipuram near Chennai, Tamilnadu, is a brilliant structure that boasts many unique features, making it one of the finest specimens of Pallava era art. Built by Narasimhavarman - II alias Rajasimha Pallava in the last decades of 7th century, it was a very notable structure even in those days when it was built. The Chalukyan King Vikramadhitya-II - a sworn enemy of Pallavas, who invaded Kanchipuram between 733 and 735 AD with all vengeance, was so completely lost with the beauty of this structural temple that instead of demolishing this structure - as per his original intent, he donated more grants for the worship of the lord and left every single stone untouched. This is not a hearsay story - the Telugu Inscription he has left behind in the temple premises carries all his feelings for the temple. The Chola King, Rajaraja-I the great, who came almost two centuries behind Rajasimha Pallava, had all pride in calling this temple “Periya Thirukkatrali” or the “Big Stone Temple”. There is little doubt that this temple was one of the major inspiration for him to undertake the colossal project of all times, the Rajaraajeswaram or Brahadeshwara Temple in Tanjore. 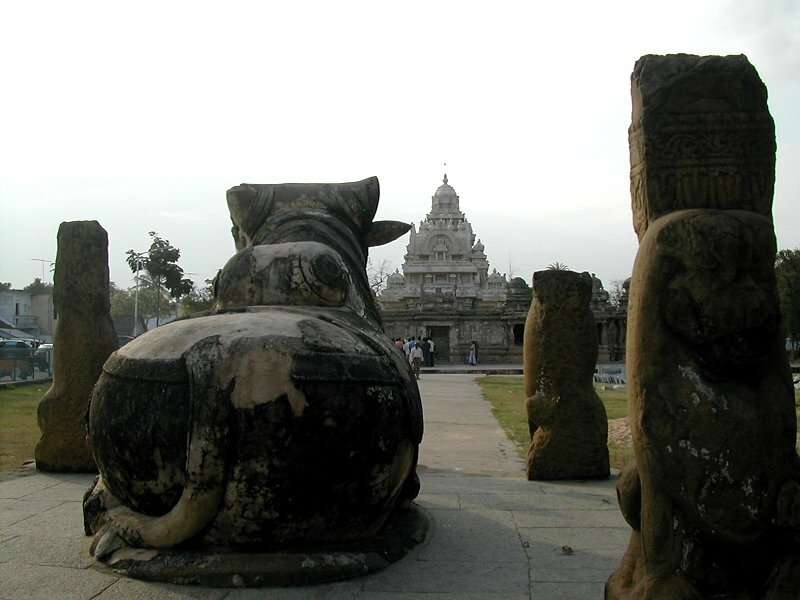 As it stands today, the Kailasanathaswamin temple is one of the earliest surviving structural temples of the land. The 58 sub temples that surround the main temple is a combination that was not repeated in other places - it defies every known Saivagamic rules regarding temple building and leaves one to wonder whether it was one of the series of artistic experiments conducted by the builder. The Devakoshtas or the niches that surround the main Garbagruha (Sanctum sanctorum) are extended to form subtemples. The Grabagruha cell has been provided with a circumbulatory passage - so effectively, there are two walls that surround the main sanctum sanctorum. A vimana with such a circumbulatory passage is called a saanthara vimana. Many of the icons found inside the temple premises are very old and unique. Despite the sudhai(lime mortor) work that has been deplorably applied upon them at a later date (which almost completely hides the original beauty and grandeur of many icons), the icons still retain their charm and exceptionality that makes a detailed study still possible. The temple is currently maintained under the auspices of the Archaeological Survey of India, which is trying to maintain the temple premises in its original flavour, with all possible care. The focus of this paper is not on the architecture or iconography of the temple. Hence, let us stop here with this limited briefing and focus on the frescoes of the temple. It is a well-known fact that many temples of ancient Tamilnadu were either fully or partially painted using organic paints of the bygone era. Most of these paintings have been completely lost, either due to the work of later renovators or due to weathering of materials in exposure to nature. 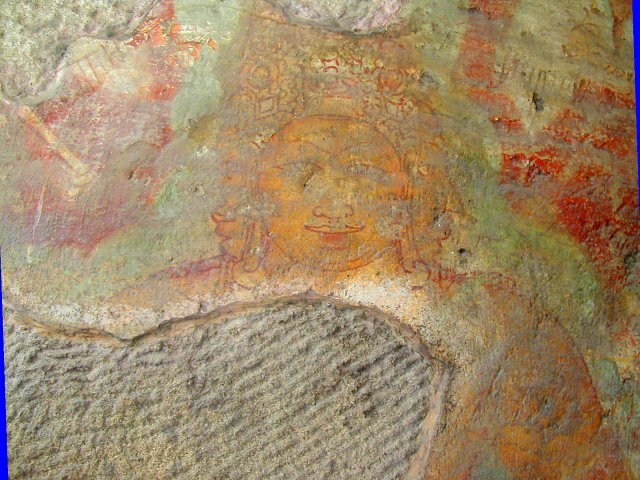 However, few of these temples have managed to retain a portion of these paintings, providing us valuable insights on the nature and beauty of these artistic works. The Kailasanathaswamin temple is one such temple that has managed to capture and retain a portion of its original paintings till date. None of these paintings have survived fully; hence it is difficult to call them full-blown paintings. Hence, I’d like to employ the term “fragmentary frescoes” in dealing with the same. 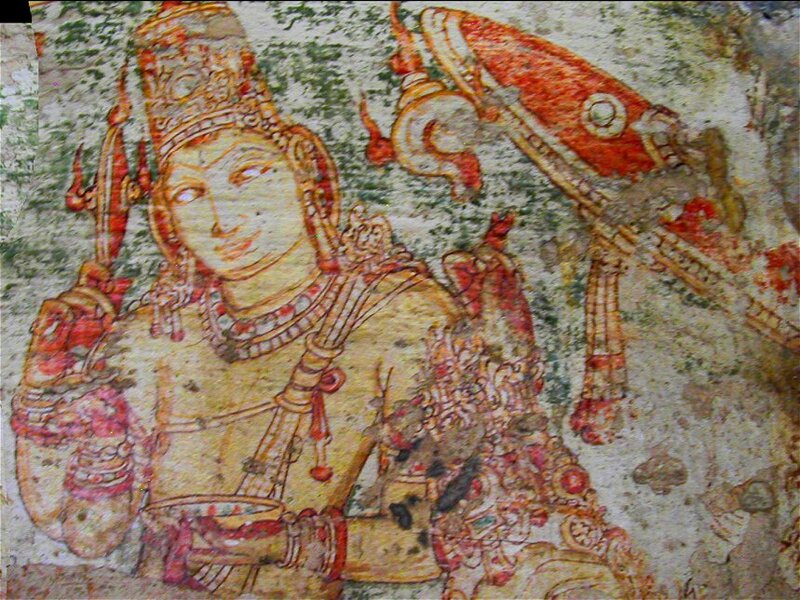 Though fragmentary in nature, these paintings, along with the Thalagiriswara temple of Panaimalai, represent one of the critical links in the history of south Indian paintings. 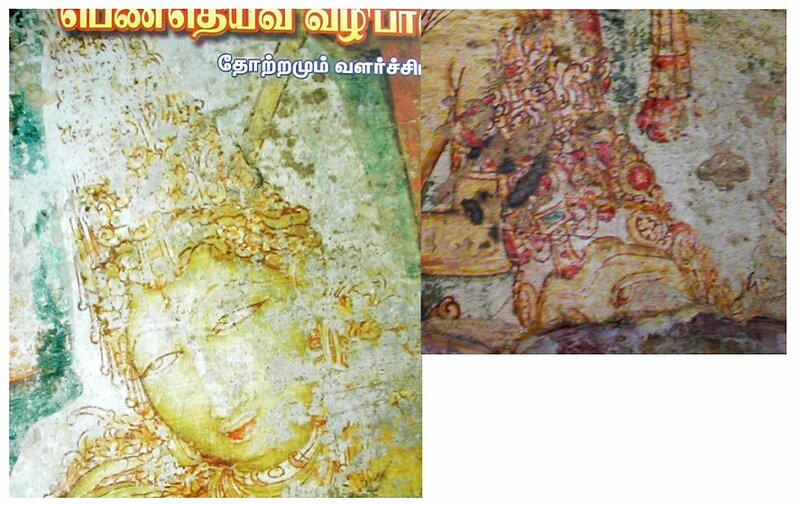 These two are the only surviving samples of the Pallava era paintings as of today. Unfortunately, these paintings have not become the objects of detailed study by any historian till date. All we find is a passing mention in many books that these two temples contain fragments of Pallava era paintings. 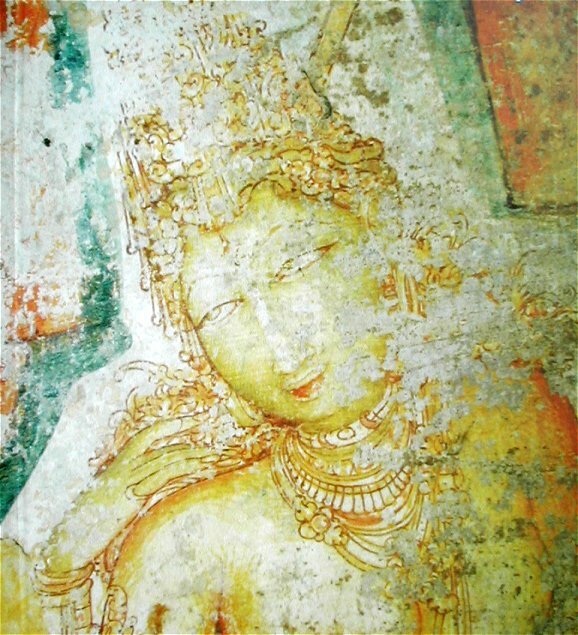 It can be established with certainty that many portions of the temple complex of Kailasanathaswamin Temple were fully painted. The fragments of these paintings are visible in many different places. However, some of these fragments are so thin that it is difficult to make any study out of it. All we can conclude is that those areas where these thin fragments are seen were once covered in beautiful colours. It is interesting to note that there are also evidences available within the temple, that not all the intended painting work was fully completed. In particular, we notice a line drawing in one of the northern sub temples without any colours being filled in. While it is an interesting specimen that allows us to postulate the different stages of painting, it also tells us that there were portions within the temple that were not fully painted - even during the sunny days of the temple. We will come back to this line drawing later. When and how these paintings were removed, is a point of debate. It can be postulated that partial damages might have occurred during that period when the entire temple complex came under the renovation plans of some un-aesthetic ruler or merchant. Most icons were spoiled with chunnam work and in the process of doing so the paintings were also completely disturbed. 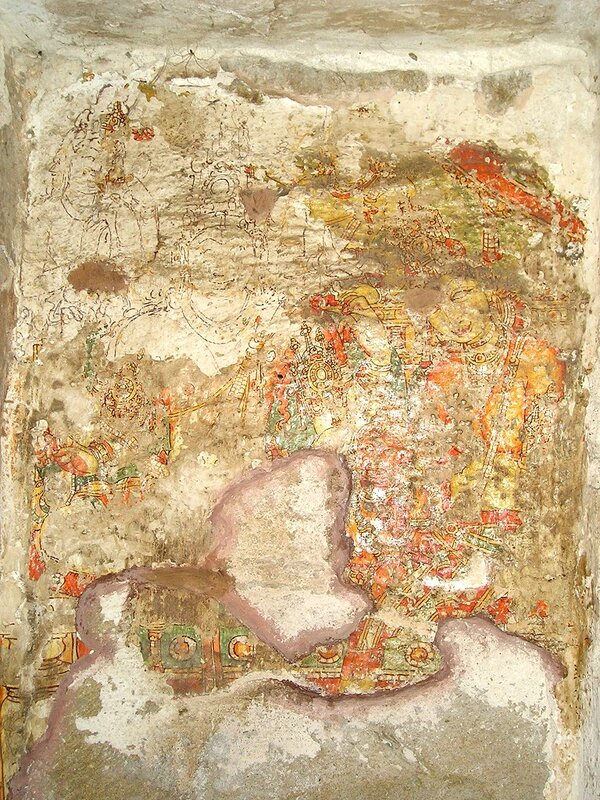 In general, paintings done on the outer walls lose themselves to the weathering of nature while the damage that occurs to paintings inside the temple walls are mostly done by human renovation or vandalism. 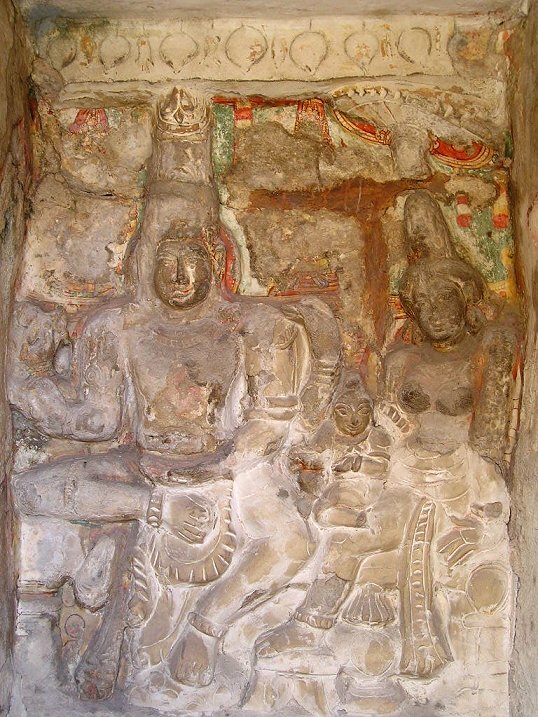 I noticed a similar situation along the outer walls of Iravathaneeswaram temple, also from Pallava era, Kanchipuram - wherein nature had almost completely eroded the original paintings leaving behind mild traces, here and there. 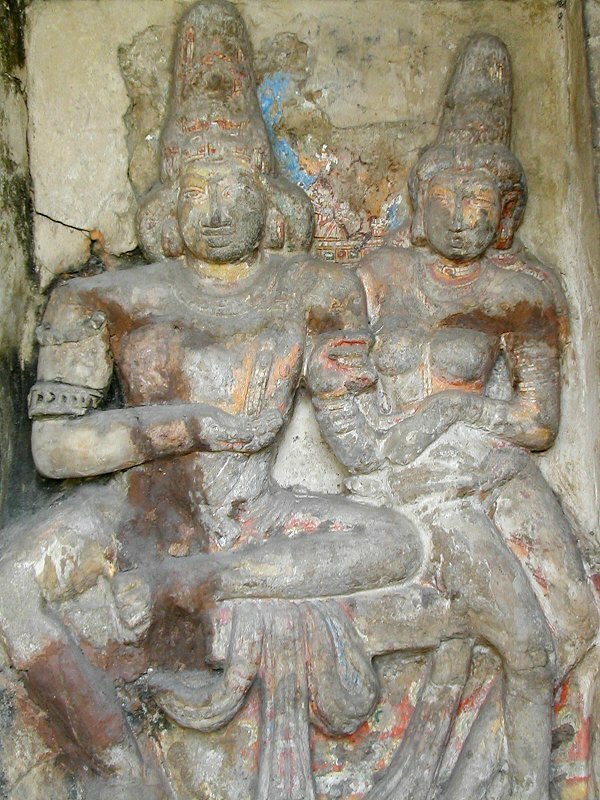 In spite of all these shortcomings, some paintings of Kailasanathaswamin temple present significant details and provide room for detailed study. No traces of paintings could be found in the Garbagruha complex and it is quite possible that there might have been paintings that have been lost, since modern day renovation is seen in almost every corner of the main cell. Almost all the surviving paintings seem to indicate that the themes of these paintings were mostly those already represented in the form of icons within the temple. However, it is difficult to make it a conclusion with all the limited material available today. The Somaskantha Group was a popular choice in the Pallava times and especially so with the builder of this temple, king Rajasimha Pallava. A Somaskantha group is the one wherein Lord Shiva is seated along with Uma Devi, his consort on his left hand side and Lord Muruga or Kaarthikeya, in infant form - being present in the middle. In many cases, Lord Brahma and Lord Vishnu are shown worshipping or prostrating the lord on either side. Sometimes, Kinnaras, Vidyadharas and other celestial beings could be shown on the sky above the group. Scholars have tried to explain the importance and significance of this group of icons during the Pallava age - the most significant one being the one provided by Dr.R.Kalaikkovan and Dr.M.Nalini in their book “Pen Deiva Vazhipaadu” - please refer page 13 of this book for further details. 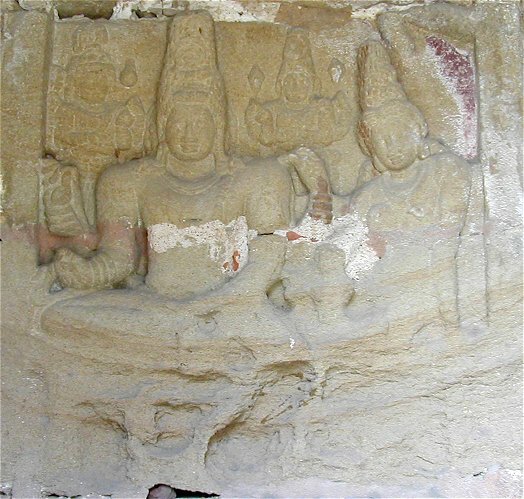 In a typical Pallava temple of the Rajasimha period, this Somaskantha panel was placed behind the main Linga of a given temple. Examples of these are Dharmaraja Ratha (Adhyantha kaama pallaveeswara Gruha) and the shore temples of Mahamallapuram. The temple complex under our study is no exception. In the main garbagruha as well as a significant number of sub temples, the Somaskantha panel has been sculptured behind the linga. Some of them even retain fragments of paintings that were applied on top of them during original construction. 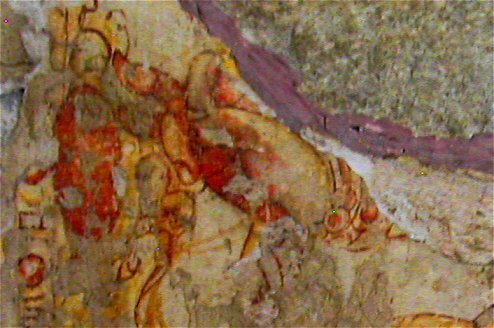 Interestingly, at least two of the sub temples on the northern side contain paintings of Somaskantha on the back inner wall of the shrine - instead of sculptures. This gives us a notion whether these paintings were intended to be the replacements of sculptural representations. No linga is seen on either of these sub temples that contain Somaskantha paintings. These two paintings will be studied in this paper. Other than the Somaskantha theme, two other paintings that have managed to survive are that of Lord Brahma and Lord Shiva in Yogic posture. 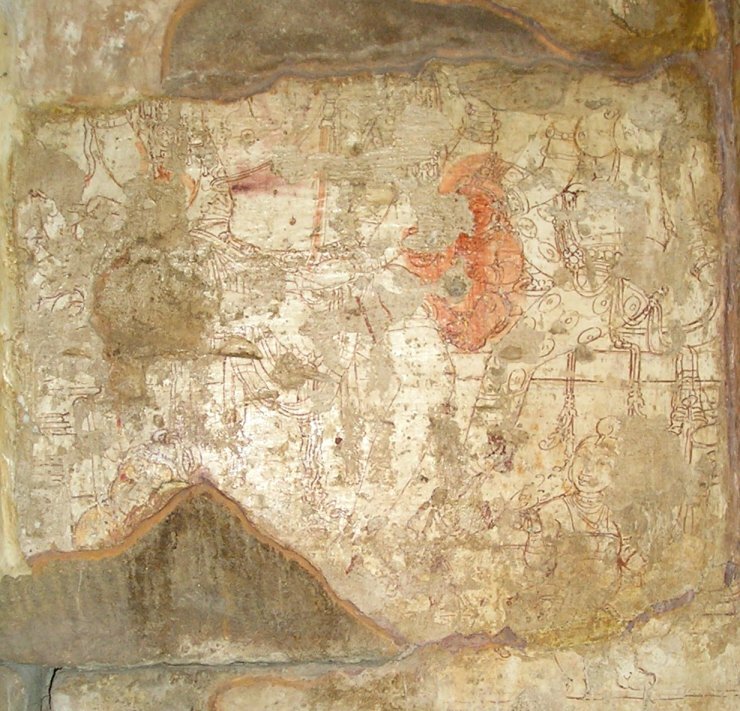 While the Somaskantha paintings are always seen on the back wall of the sub temples, the latter paintings are noticed on the outer wall of the sub temples - in the western side. Two other interesting additions to the above themes are fragments representing celestial beings in air. These two fragments could have been a part of the Somaskantha panel as well. The posture and ornamentation of Lord Shiva, as seen from the limited fragments available seems to be a painted version of the sculptural representations available in other portions of the temple. There are minor variations among the different Somaskantha panels. The most noticeable one is the difference in the manners of reverence to Lord Shiva, by Lord Vishnu and Lord Brahma. In some cases, they hold their hands in anjali pose (with clasped hands) while in other cases they hold a small container with flowers and perform pooja to Lord Shiva. Let us take the first Somaskantha panel (No.1) for study. One of the things that looks relatively unimportant - but which seems to be of significance to me - is the light green patch seen on top of Lord Shiva’s head and near Lord Vishnu. 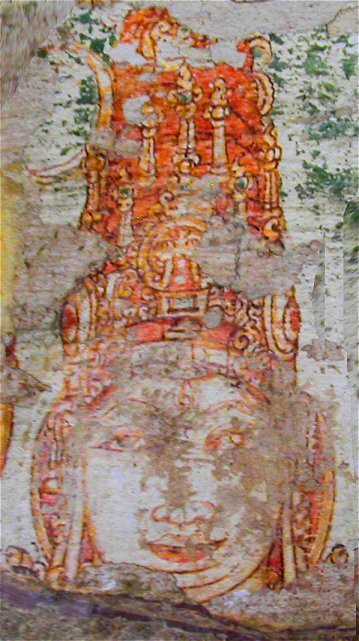 I’ve observed similar patching almost throughout the chola frescoes of Raajarajeeswaram, Tanjore. Earlier, I thought that this was a kind of background the chola artisans employed through all of their paintings. But the presence of a similar patch makes me think that it has more that what meets the eye. These patches are particularly seen when the original colouring on top of the painting has given away. Hence it could be an organic layer that was first applied before the original painting was really done. This requires further study. Now let us focus on the individual icons. Lord Shiva is seen with highly ornamental Jata makuta with a moon fragment on top of his head. A siraschakra behind the face enhances the look. With a third eye, he wears a pleasing smile. The elongating ears should have given room for the makara kundala and the bhadra kundala, which have been lost. He is seated in sukhasana. His left palm left to remain on top of his hip and the artisan beautifully brings out the relaxed nature of this posture by the various natural movements of the fingers. The palm has been shown red in colour. The right hand is showing a mudra that is difficult to identify with any of the known mudras of bharathasastra. In this mudra, the thumb seems to be reaching out to touch the middle portion ring finger, which is bent down. The index finger is shown to touch the thumb while the other two remain straight. The closest match from Bharatha’s Natyasastra of this mudra is Sukha thunda - but here the thumb does not seem to touch the index finger. The two backhands of Shiva are lost and may have to be studied from a different panel. The accompanying Uma Devi figure has suffered serious damage and it is not possible to make out anything other that the head and the eyes. It is worthwhile comparing this fragment with that from panaimalai. The child muruga is seen with his characteristic senni, decorated. The sanna veeram that runs across his chest is also characteristic of this deity. His left hand is in kataka hasta pose while the right hand mudra could not be identified because of the damage. Lord Vishnu striking representation has survived without much damage. He is seen with his characteristic kireeta makuta with notable ornamentation. The yagnopavita, urs sutra and sthana sutra are seen flowing down from his left shoulder all the way to through the chest and ending in his hip. He is holding a small flower pot on his left hand and performing pooja by throwing followers with his right hand. The two backhands are holding sankha, the conch and chakra, the wheel in kataka mutra. He has been painted only up to his hip. An ornamental umbrella is seen near Lord Vishnu. Lord Brahma has been completely lost in this panel and but for his jata makuta, nothing much can be made out. The next figure represents another Somaskantha group panel from a different sub temple inside the same premises. Here, some more details of Uma Devi could be seen, her seated posture being something similar to the sculptures.She wears an adorable smile - but overall, the facial beauty is not comparable to the panaimalai representation. The two backhands of Shiva are also visible. He seems to be in Kataka hasta - but no weapon or object can be seen in either of his hands. It is possible that these objects have been skipped to provide better visibility for Lord Vishnu who is standing behind. When such objects are missing in the hands of the main deity, they might be represented as “Aayudha Purushas” (Personified weapons) - whether their images were painted in this panel or not, we might never know. The vastra yagnopavita, urs sutra and sthana sutra of Shiva can be better seen. It is interesting to note that the yagnopavita traverses over the right hand of the lord. The beautiful ornamentation on the shoulder ornament is worth noticing. 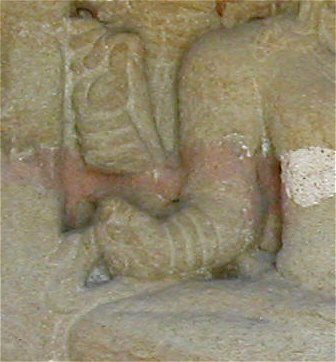 The unique mudra on his right hand is retained here as well. Another notable feature of this panel is that Shiva seems to be wearing a red jacket covering the upper portions of his chest and portion of his hands. This was not visible in the earlier painting. Lord Vishnu and Brahma are seen in anjali posture (worship mode) unlike the earlier painting where they were performing pooja with flowers. Seeing the incomplete colours on top of the panel covering Shiva’s face, backhand and Brahma, I originally assumed that the Pallava artist who first painted this panel did not complete his work. But a careful examination seems to suggest that the original painting was lost in those areas and an immature attempt has been made at a later date to complete the painting. The white colour layer that seems to have been applied on top of the original painting, the immaturity of the artist seen whatever lines he has drawn - Lord Brahma in particular - seem to be reasonable justifications to this assessment. However, it cannot be stated with certainty at this point of time. 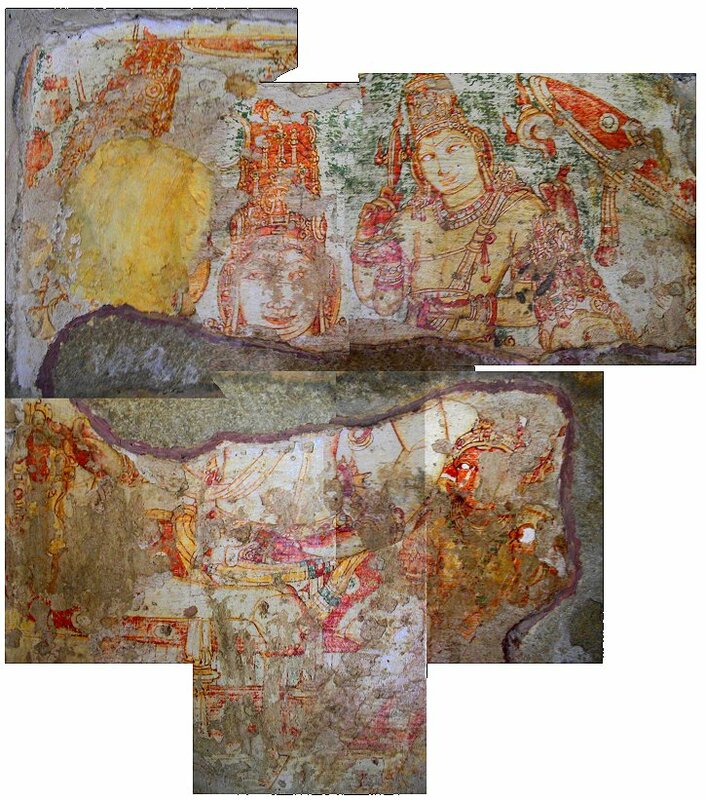 This challenge becomes more pronounced, seeing the third panel - which is a rare representation of the original line drawing of Pallava artists, over which colours were applied to complete the panel. While the upper portions have been lost, the bottom portions are visible in better detail. Of particular interest, are the ganas shown near the feet of Uma Devi and Lord Shiva. The legs of the female gana near the feet of Uma do not seem to be human in nature.Only the head of the gana is visible near Shiva’s feet. 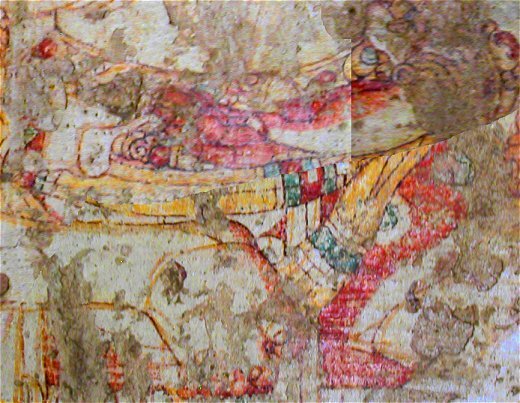 This line drawing seems to suggest that not all paintings were fully coloured during the original construction phase of the temple. At least some of them should have been left in semi-finished stage during the consecration ceremony and subsequently the work was never taken up. A combined evaluation of all the different Somaskantha panels seem to suggest that the panel had more characters that what we have today. We would see, in a later fragment which we have not yet discussed, that not only the main wall but the two side walls adjacent to the main back wall were also painted. A portion of Lord Brahma’s head and body has survived from this panel. The panel seems to suggest that at least on the outer walls of the sub temples, artisans have experimented different kinds of deities. The other notable aspect of this panel is that Brahma has been devoted almost the complete wall - thus making him a prominent figure. This panel is painted on a wall, which is pretty close to the nearby wall of the next sub temple. It should have been with considerable difficulty that the artist who did this painting must have carried on his work.